SANFORD, FL—At the end of a three-week trial in which they sought to prove their client innocent of the murder of teenager Trayvon Martin last year, defense attorneys for George Zimmerman presented closing arguments to jurors on Friday, saying that while he is “not the most wonderful person they’ve ever known,” Zimmerman is “you know, a decent enough guy.” “Listen, he’s not the greatest guy in the world, but what do you want to hear? 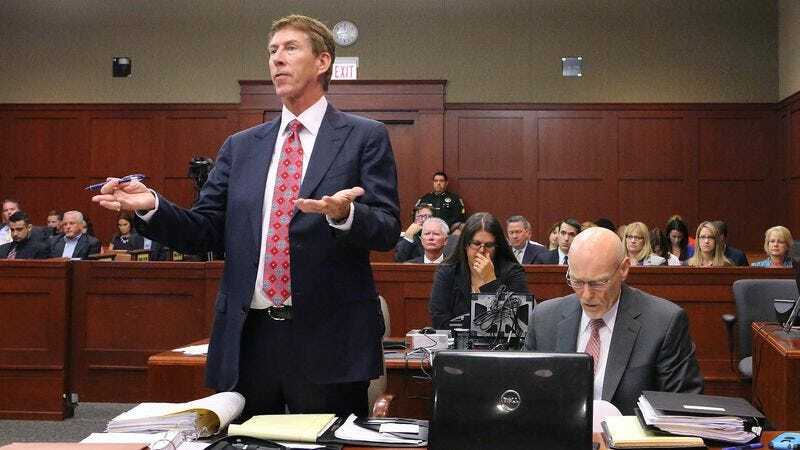 He’s…well, he’s an okay person, I guess,” chief defense lawyer Mark O’Mara told the panel of six jurors, adding that his legal team doesn’t really know Zimmerman very well but that he seems fine, for the most part. “I mean, look: Are we best friends? No. Will I keep in touch with him after this trial? Probably not. But he’s basically a tolerable person, from what I can tell. I don’t know. I could be wrong. He could be a bad guy. Kind of hard to tell, though, you know?” O’Mara ended his remarks by shrugging his shoulders and silently walking back to his seat.